Photograph depicts brown and white building similar to the "Director's Lodge" at Cassiar, B.C. (see items 2000.1.1.3.19.88 and 2000.1.1.3.19.89). 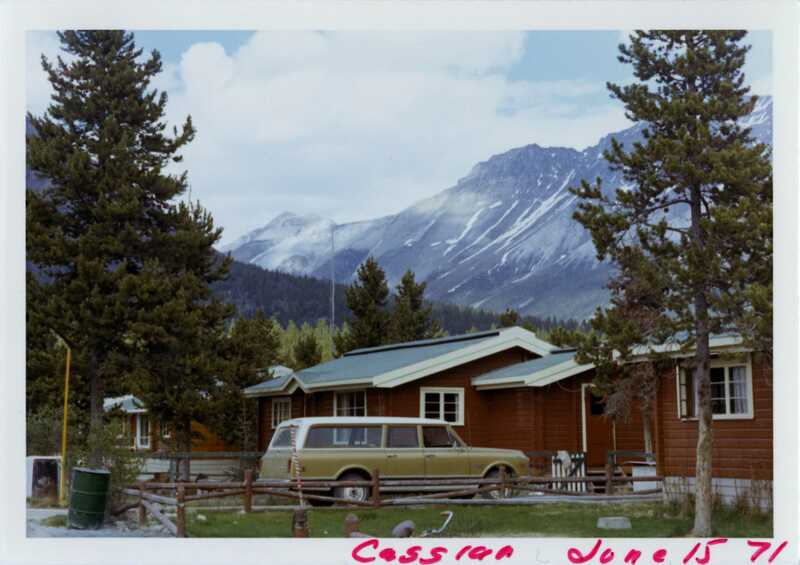 Station wagon parked in driveway behind short fence in foreground. Trees in foreground, forest and mountains visible in background. Handwritten annotation on verso of photograph: "Cassiar June 15 71". Item is one of 20 photographs taken together in 1971. Photos have been rehoused, arrangement imposed by archivist. Item is part of the Cassiar Asbestos Corporation Ltd. fonds. Image is one of 20, see items 2000.1.1.3.19.78 - 2000.1.1.3.19.97.